When Bryce Harper and Manny Machado hit the open market as part of the heralded 2018 free agent class, it seemed like a foregone conclusion that the big market teams would start a bidding war for their services. The Yankees, Dodgers, Phillies were supposed to headline the teams that would do whatever it took to acquire one of these franchise players. However, we have seen these teams shy away from such a massive commitment in favor of multiple signings and staying under the luxury tax. Andrew McCutchen, DJ Lemahieu, AJ Pollock, Michael Brantley, and others have come off the board before two 26-year-old MVP candidates. In the past, we see these top players sign first and set the tone for the offseason. Fans of these large market teams are understandably frustrated with the lack of major signings. The teams that everyone has expected to be the major players in free agency this offseason have shied away. While the focus on these large market teams is not necessarily misplaced, perhaps smaller market teams are being let off the hook for their absent pursuit of top free agents. This is not a plea to teams’ ownership to spend more money. Maybe owners should or should not be investing more money into their team’s payroll but that should not be the focus surrounding these top tier free agents. Owners often have stakes in many different businesses and profit is their priority over winning. Perhaps you think they should sell the team, but it is easy to demand more money when it is not your own. I want to focus on how small market teams can afford the Machado and Harper level players and still contend for a World Series without spending any more money than they do now. I compiled a list of every contender since the institution of the Wild Card Playoff Format in 2012. The criteria included every team that had a higher total fWAR during the regular season than either of the teams in the World Series. This is a flawed measurement and perhaps some contenders were left off and some non-contenders left on, but it left me with a 43 team sample size to collect data from of at least talented playoff teams. The idea was if a team accounted for a certain amount of fWAR and made the World Series, then any team with more fWAR from the season was a more talented team and could have won a championship. Coming into this study, I had no real expectation, only curiosity as to which teams should be pursuing top free agents. I decided to measure the cheapest teams by the percentage of the MLB Luxury Tax Threshold that a team spent to help adjust to compare year to year fairly. The first team I studied was the 2014 Pittsburgh Pirates. Andrew McCutchen, Russell Martin, Josh Harrison, and Starling Marte led the second strongest group of position players in the league to 88 wins and a Wild Card birth, where the team fell to the eventual champs, the San Francisco Madison Bumgarners. The Pirates were the cheapest contender by my criteria since 2012, paying only 38% of the Luxury Tax Threshold that season. However, maybe it is easy to contend on that type of budget with MVP level McCutchen only making $7.4 million with Harrison and Marte making less than $1 million. On top of that, pitching staff ace Gerrit Cole was also still in pre-arb making just about $500k. None of this was a surprise, as the most successful teams with a low payroll had plenty of young, controllable talent on cheap contracts. So, where would Bryce Harper fit on this roster? Taking a closer look at Pittsburgh’s 2014 roster construction, the Pirates could afford a $30 million contract with room to spare and become a better team because of it. The team’s highest-paid player was Wandy Rodriguez, who at $13 million produced -.8 fWAR. The rotation was filled out with $6 million of 1.8 fWAR from Francisco Liriano and $5 Million of .9 fWAR from Edison Volquez. Role players Jason Grilli and Clint Barmes combined for $6.25 Mil and .3 fWAR. The contributions of these players totaled up to $30.25 Million for 2.2 fWAR. Obviously, fWAR has its flaws, but the main objective is to find how much value over a freely available player is a certain player worth. Machado and Harper are both seemingly available for $30-$35 million a year and are projected for 5.1 and 4.9 fWar, respectively. Combining these players with four replacement levels player at league minimum wage gives you far more value than this group from the 2014 Pirates. In every scenario, the teams were successful despite these players that combined for very few Wins Above Replacement for an extremely high cost. The 2014 Pirates and 2015 Astros each paid 38% of the luxury tax threshold to become contenders. This year the lowest percentage of the luxury tax threshold were the Athletics at 43%. Even those 2018 Oakland A’s paid Jonathan Lucroy, Santiago Casilla, Matt Joyce, Yusmeiro Petit, and Brandon Moss $26 million for a total of 1.5 fWAR. If the Pirates and Athletics have the payroll room to afford these types of players, then there should be no team that is uninterested in Machado and Harper this offseason. The easy conclusion to draw is a lot of teams hand out some inefficient contracts but every team does so they can still contend in spite of that. However, I believe teams are more willing to spread out money among multiple players as opposed to a large investment into one player. This is not the most shocking revelation, obviously, it is much easier to swallow spreading your wealth to ensure its safe keeping. However, what it does do is unearths the often told lie that some MLB teams cannot afford Machado or Harper. The single cheapest team in the league could have been made better by paying a player like Harper $30 Million in exchange for 5+ fWAR. The unsolved part of this equation though is how to fill out the roster with such a large commitment to one player. Here is a graph of the past 25 seasons with the amount of WAR that has been produced by players aged 23 and under. There has been a slow and steady incline of production from younger players in MLB. 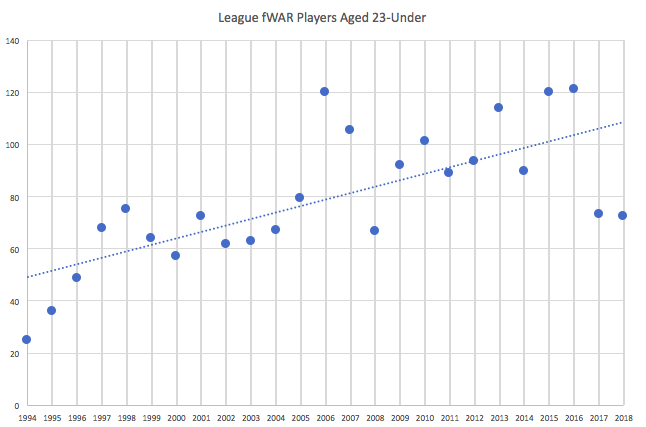 Young players are spending less and less time in the minor leagues and are becoming productive major leaguers earlier in their development than ever before. Think of Ronald Acuña, Rafael Devers, Carlos Correa as young players who were ready to contribute with just one season of AAA or less under their belts. The Royals this year alone trotted out a team of many replacement level minor leaguers. Unheralded rookies Tim Hill, Heath Fillmyer, and Glenn Sparkman among others pitched at replacement level for Kansas City in 2018. The idea is that teams should start to spend money on a proven, distinguished super star, and let their player development help build the farm system with productive auxiliary pieces. By definition, these teams should be able to fill out their roster with replacement level players at no added cost and still have more production than they are currently receiving while still being successful. While conducting this research, I wondered whether a team could be successful with just those top stars. I wanted to see if there w any underlying numbers that proved that having a classic well rounded team was more effective than teams that were more top heavy. In 2018, fWAR accounted for about 84% of total team wins. Therefore, we can roughly predict a team’s win total for a given season using the equation y= 1.0537(x)+45.915, where y is team wins and x is total fWAR. I used this equation for an expected win total for teams in 2018, and I wanted to see which teams over or underperformed their expected total. In order to measure how teams roster was constructed, I took the best 10 players on each team and found the standard deviation of their fWAR. So, teams with lower standard deviations had a more well-balanced team whereas the higher standard deviations meant more parity within the top 10 players on each team. So, I used the expected Win (xWin) equation and compared it to the real Win totals from 2018. I compared these residual values to the Standard Deviation of each team’s top 10 players and I found that there was no correlation between the two. In simpler terms, top heaviness or balance did not factor into a team’s success. For good measure, the Dodgers and Indians both significantly underperformed their xWin but the Dodgers had a low standard deviation and the Indians had a high standard deviation. The Red Sox and Giants both overperformed their xWin while the Red Sox were a top-heavy team and the Giants were a more balanced team. The conclusion to draw here is that constructing the most efficient roster has much to do with total value and not much to do with how that value is put together on a micro level. In fact, there was a positive correlation between Wins and Standard Deviation of those top 10 players albeit a fairly weak one. My point is that teams should be focusing on adding as much value, which I measured using fWAR, as possible at the price they can afford, regardless if it comes from one superstar and five replacement level players or six equally valuable players. The players like Machado and Harper are a sure enough bet to produce at a high level that a $35 Million commitment should absolutely be in play for them. This is an unusual circumstance where two superstars are hitting free agency before their prime seasons. Obviously, what comes to mind is plenty of the bad contracts that have been signed for players well into their 30’s such as Albert Pujols, or Alex Rodriguez. However, a team contending now should take that risk to improve their chance of a World Series in the next six years and still be able to find success with the final four years on the contract. More so, we have already seen teams that waste upwards of $40 Million and still compete for a title. A record-setting contract for Harper or Machado would not only pay early dividends but also not cripple a franchise in the future. While signing one player to such a large contract seems risky, overall it is more than likely risk-averse compared to spreading the same amount of money over several players. Twenty-six-year-old MVP candidates are a safer bet to perform than a collection of five 1.5 WAR players. The Machado and Harper issue this offseason is not a problem of overall spending, but an issue with roster construction. Very rarely do players of Machado and Harper’s caliber reach free agency at 26 years old, and teams should do whatever it takes to acquire these players. Whether it be the Dodgers or the Athletics, every team can afford these contracts and still build a contender around their new franchise cornerstone.